The auction is set up as a Dutch auction in which the price starts high and works its way down. Bidders get only a few seconds to bid on the flowers before they are sold and passed on to the new owner. On 1 January 2008, the auction company merged with its biggest competitor Royal FloraHolland. 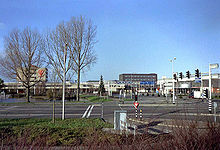 ^ "Aalsmeer information". Archived from the original on 2008-01-02. Retrieved 2008-01-24. This page was last edited on 11 March 2019, at 18:25 (UTC).